Cooking in a small space has its challenges with our house a mess due to a water leak we had to move out. That was kind of a surprise but understandable. We will be trying a lot of the premade dishes on the market today. With the busy lives that everyone has it could be handy to know how they taste and cook up. 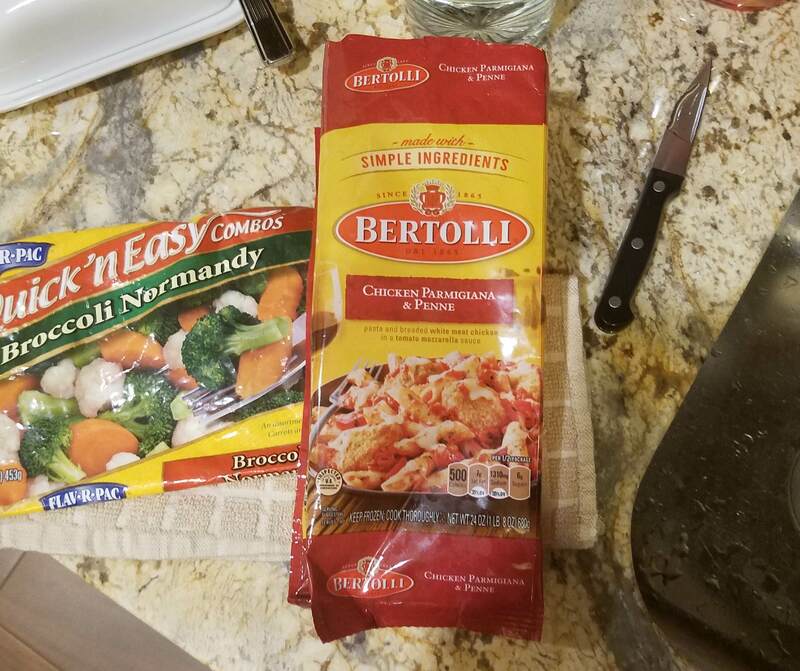 First meal we are trying is a Bertolli dish, chicken , red sauce and penne noodles. Flavor was excellent, the chicken was breaded and a lot of the spices were in the light breading. We added frozen vegetables to balance out the mealalso served with a nice roll for mopping up the sauce. What can you make in a small cooking area? With the vegetable mix the meal turned out real good. What I didn’t like about the all in one package was that the cheese just in with everything else, when the cheese melted it was a mess on the utensils. If the cheese was in its own package you could add it at the end and you could control where it went in the dish. Would I use the product again, I would say yes.